Your child’s day is full of transitions from one activity to the next. They go from peaceful sleep in their beds to going through the morning routines of eating breakfast, brushing their teeth, choosing what clothes to wear and so on. They leave home to go to school and leave school to go to sports, art classes, or other activities. We ask them to set aside their toys to come eat a meal. Although these transitions may seem minor to us adults, they can feel huge to your son or daughter. It’s not uncommon for children to show behavioral signs that indicate they need some encouraging guidance to handle their transitions smoothly. 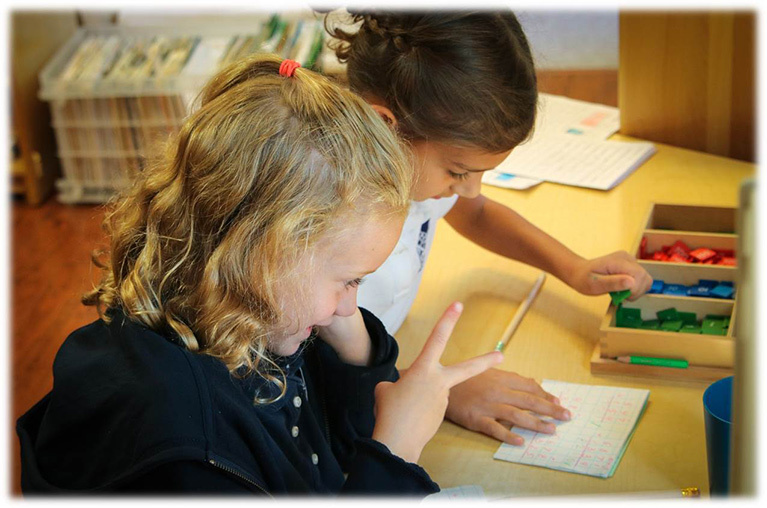 Unlike traditional schools, which often approach such issues with threats or punishment, the Montessori approach seeks to help children manage their daily transitions successfully. We use numerous techniques championed by Maria Montessori, and others like her, who believe that teaching children skills to handle learning, social interactions, and self-care equips them to excel in every area of life for years to come. What do these Montessori techniques look like, and how do they help your child effectively handle classroom transitions during the school day? Here’s a look inside our approach. They work well in our classes — and you may find them effective at home as well. Attention spans can vary depending on many factors, including your child’s age, their interest in the activity they’re performing, environmental distractions, and more. At age 3, a child can focus for 6-15 minutes on a given task. As you can see, young children are not going to concentrate for long periods. So, in our classrooms, our Montessori teachers keep an eye on students and look for signs their attention is waning — such as fidgeting. Children often benefit from a simple, quiet, physical reminder that they are not alone and that others are being impacted by their behavior. In the classroom, if we notice a child is restless, we may go sit with them. Many times, all it takes to settle that child is to place a gentle hand on their shoulder and give them a firm, kind look to remind them to focus. When children are showing signs of inattentiveness, it is frequently because they don’t know what to do next. So, ask them to do something. When children have a sense of purpose, they find it easier to stay focused. Invite the child to choose their next activity, such as choosing what they want to work on, or finishing a picture they worked on earlier in the day. Ask the child to help with a task you are performing, such as cleaning up, putting away toys, or measuring out kitchen ingredients. Even for adults, it can be hard to switch gears from one activity to another. So, it’s not surprising children might find it challenging too, especially since they are still learning about self-discipline. In Montessori classrooms, we might play some music every day or engage in a brief social activity such as shaking hands as a signal to children that they are moving from one activity or location to another. At different ages, children will naturally focus more on activities that are developmentally significant. Children between ages 3 and 6, for example, are highly attracted to and engaged in activities that involve language. This makes sense, as it is the age where children are actively acquiring language. A game involving language can therefore be a great way to draw the child’s attention and help them focus. Parents may be tempted to encourage their child to move into activities, either at home or in school, before the child is ready to do so. It’s important to let your son or daughter develop at their own pace. Let their developmental behaviors and skills guide you on what you ask them to do. If they are able to blow their own nose or tie their shoes, for example, we encourage them to do so. But if they are not yet skilled in those ways, it is perfectly okay to encourage them to do what they can as we aid them. Some things are a part of human nature. Even adults can refuse to line up properly or have a hard time quieting down to listen to a speaker. Children are no different. So, find ways to make these areas engaging, rather than task-oriented. Instead of telling everyone to line up at the door, we might invite everyone to tiptoe behind each other. This invites concentration and a sense of fun to an activity that could otherwise be frustrating. That invitation to fun is a sure way to help children transition to the next activity. As an active, accomplished, focused parent in Rockville, you want your child to enjoy success in every area of life. Successful people frequently credit their own accomplishments in life to what they learned during their Montessori years — and your child can benefit from those same traits and skills too. To learn how a Montessori education can benefit your son or daughter, request our free, handy guide — How Montessori Gives Your Child a Balanced Education—at School and at Home. And let us know if we can answer any questions or if you’d like to schedule a tour of our school.